Being the stubborn one that I am, I made over 12 batches of crust (?!) and researched countless methods before landing on a recipe that that was easy, flaky, and perfectly delicious. 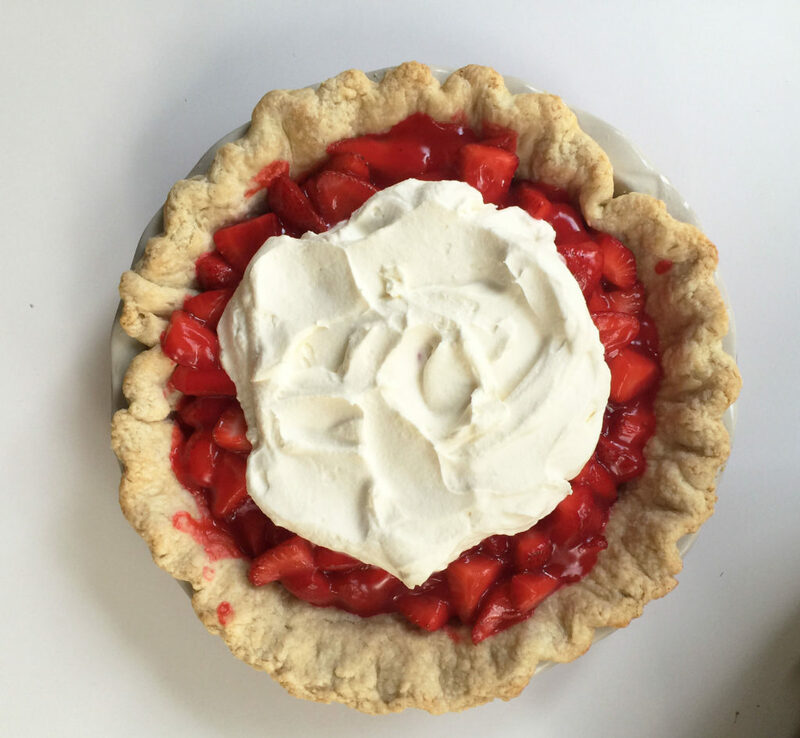 I’ll share that method with you in a separate post (because if you’ve made pie crust before, the method might below your mind) but today I’m sharing with you a recipe for strawberry pie. Consider Espresso and Cream your go-to destination for pie through the end of the year, because I’ve committed to making and sharing one recipe per week throughout the remainder of 2016. I want to get back into the kitchen, get back to this blog’s roots, and dust off my pie-making skills. A little culinary challenge is good now and again, right? Naturally, I decided to kick off this pie challenge with one of my husband’s all-time favorites, strawberry pie. He’s been begging me to make a strawberry pie all summer. My requirement: strawberry pie must always be easy and packed with strawberries. We’re talking a very high strawberry-to-glaze ratio since I really dislike Jell-o-type consistency. Joe really dislikes whipped cream, but I can’t make a strawberry pie without it, so I made a stabilized version that allowed me to top the pie with real whipped cream in advance without it weeping/falling. PS: I took the “cheater way” out with a packet of Danish Dessert in the filling. I’ve never made a strawberry pie this way before, but it turned out great and was the perfect glaze for the strawberries. In a medium saucepan over medium-high heat, combine the water and Danish Dessert mix together. Bring to a boil, stirring frequently, and boil for 1 minute. Remove from heat and stir in the strawberries to coat evenly. Pour strawberry mixture into pie shell and refrigerate for at least six to eight hours. To make the whipped cream: Place heavy cream in the bowl of a stand mixer or a bowl with a hand mixer. Beat whipped cream until soft peaks form. Dissolve the gelatin in the ¼ cup of warm water and stir to combine. Pour mixture into heavy cream and continue to whip on high speed until stiff peaks form. Spoon whipped cream on top of pie and store for up to 24 hours.